This is my favorite dish. Sambar is called as Kolmbo in Konkani. I prepare this dish atleast once in a week. Very simple, tasty and easy recipe. It goes well with plain rice, idli, dosa and ragi balls. 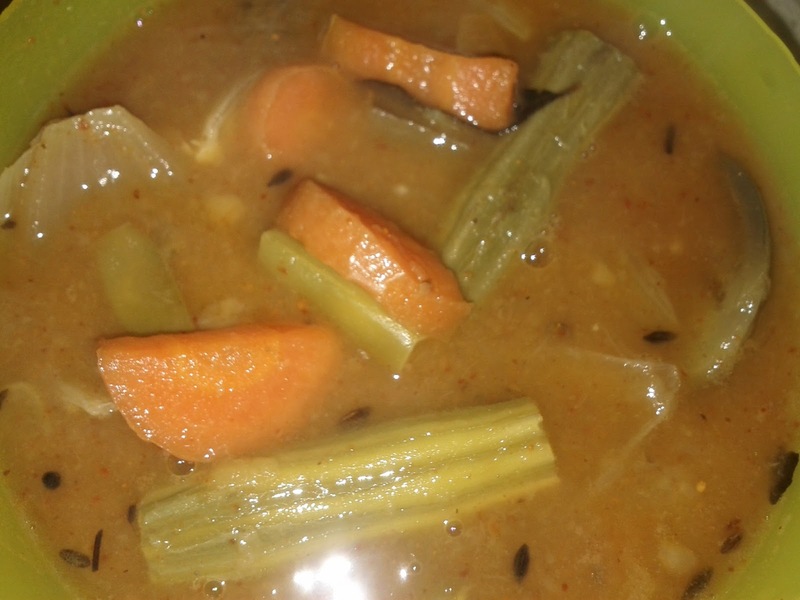 I use sambar powder prepared by my mother-in-law. Before I used to make it from MTR or Ganesh sambar powder. I will post someday the recipe for my mother-in-law's sambar powder. Who ever has tasted my mother-in-law's kolmbo has become a fan of it and I too belong to that group. So my mother-in-law gets me a bottle of sambar powder every time. I am not cooking toor dal and vegetables together because toor dal will take more time to cook by then all the vegetables will get over-cooked. 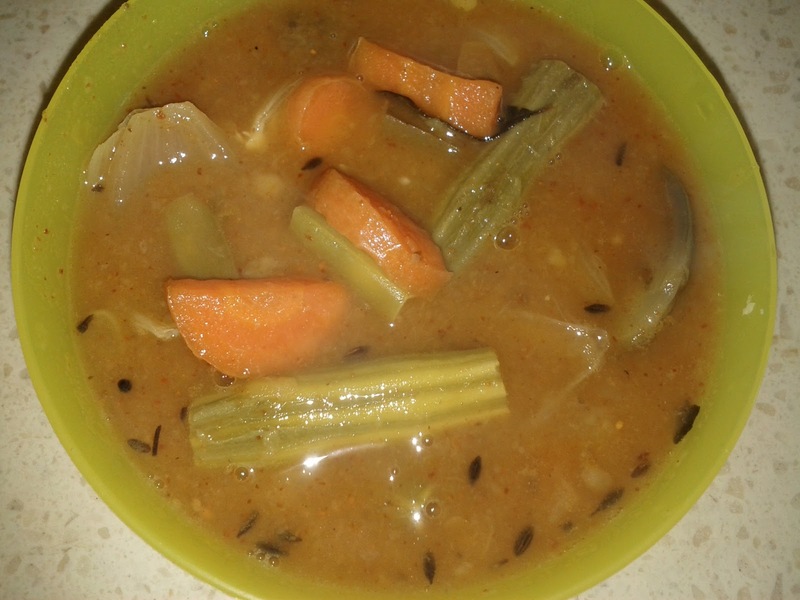 Better to dissolve sambar / kolmbo powder in water or tamarind water. In a cooker, add toor dal, turmeric powder, oil and 3 glasses of water. Wait for 2 whistles and switch off the flame and wait until it cools. Transfer the cooker content into a bowl and in the same cooker, add ghee and fry all the vegetables in it for 2 minutes. This will give a nice flavor. Now add the dal content that was transferred to the bowl again into the cooker and add little water and wait for 1 whistle. Let the flame be high so that vegetables will not get over-cooked. In a small bowl, take the tamarind water and sambar / Kolmbo powder and mix them well. After 1 whistle and on cooling, open the lid and start to boil again. While it is boiling add the tamarind water and sambar powder which is in the bowl. While it is boiling, heat the normal oil / coconut oil in the spatula for seasoning. Add cumin seeds, mustard seeds, green chilies, red chilies and curry leaves. Wait until it's color changes to brown. When it starts to boil add this seasoning to it and serve hot with plain rice, idli, dosa or ragi balls.